Nicolas Graham, “State-Capital Nexus and the Making of BC Shale and Liquefied Natural Gas,” published in BC Studies no. 194, Summer 2017. George Abbott, “Persistence of Colonial Prejudice and Policy in British Columbia’s Indigenous Relations: Did the Spirit of Joseph Trutch Haunt Twentieth-Century Resource Development?” published in BC Studies no. 194, Summer 2017. BC Studies is pleased to announce that Nicolas Graham is the winner of the 2017 BC Studies Prize. Congratulations to Nicolas and to George Abbott, the honourable mention. Both articles are now available to read, open access, on OJS. 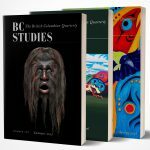 The BC Studies Prize is awarded to the author of the best paper published in the journal each calendar year, judged by the editors and members of the BC Studies Editorial Board to have made the greatest contribution to understanding British Columbia. The prize, which is funded by donations, is intended to encourage and celebrate high-quality work on British Columbia, regardless of topic or discipline. In recognition of the generous lead donation of the UBC Museum of Anthropology, 2015-2030 recipients of the BC Studies Prize each receive a specially-commissioned piece of art work by Musqueam artist Susan Point.